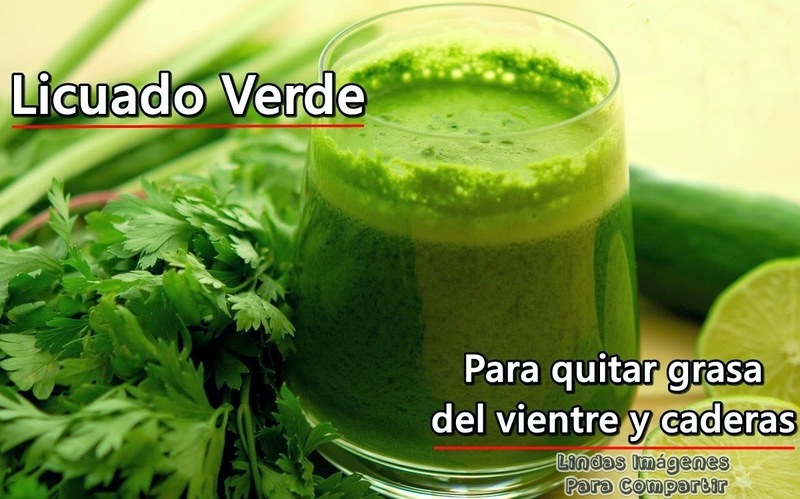 AQUÍ TE PRESENTAMOS UN EXCELENTE LICUADO VERDE PARA LAS PERSONAS QUE APARTE DE PERDER PESO, DESEAN QUEMAR ESA GRASITA INDESEABLE. TAMBIÉN ES UN EXCELENTE ANTIOXIDANTE Y AYUDA A COMBATIR EL ESTREÑIMIENTO. SIRVE TAMBIÉN PARA LAS PERSONAS QUE RETIENEN LÍQUIDOS O QUIENES PADECEN DE COLITIS. TODO LO ANTERIOR SE LICUA Y EL OBJETIVO ES QUE SE TOME SIN COLAR, PERO SI NO LO TOLERA, PUEDE COLARLO Y PONERLE UN POCO MAS DE AGUA O MIEL AL GUSTO. SE DEBE DE TOMAR INMEDIATAMENTE DESPUÉS DE HABERSE LICUADO TODOS LOS INGREDIENTES. TAMBIÉN PUEDEN PONERSE TODOS LOS INGREDIENTES EN UN EXTRACTOR DE JUGOS, AUNQUE EL OBJETIVO ES QUE SE TOME CON LICUADO. DIARIAMENTE POR LAS MAÑANAS EN AYUNAS, DURANTE 7 DÍAS CONSECUTIVOS. POSTERIORMENTE DESCANSAR TRES Y DESPUÉS REPETIR. DESCANSAR DOS SEMANAS Y CONTINUAR EN CASA DE ASÍ DECIDIRLO. TE INVITO A PREPARARLO, ES ECONÓMICO Y VERAS QUE FUNCIONA MUY BIEN!